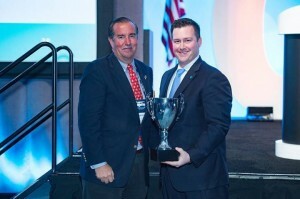 February 24, 2016 (San Diego, CA) – During the 89th World Conference on Club Management, held February 21-25, Mitch Krach, General Manager of Cypress Lakes and Big Cypress Golf Club, and Vice President of the Florida Club Managers Association of America (FLCMAA), accepted “Chapter of the Year” award on behalf of the Florida Chapter. About FLCMAA – FLCMAA is the professional association for managers of membership clubs in the state of Florida. With over 700 members across all classifications, our managers run more than 300 country, golf, city and yacht clubs. The objectives of the Association are to promote and advance friendly relations among persons connected with the management of clubs and other associations of similar character; to encourage the education and advancement of its members; and to assist club officers and members, through their managers, to secure the utmost in efficient and successful operations. The Florida Chapter is a subsidiary of the Club Manager’s Association of America (CMAA). Our chapter is recognized as the organization’s largest chapter and represents close to 10% of all CMAA members worldwide. Florida Chapter members meet regularly for education and networking events in five geographic regions around the state: Everglades, Gator, North, Seminole and Sunshine. About CMAA – CMAA is the professional Association for managers of membership clubs. With close to 7,000 members across all classifications, our manager members run more than 3,000 country, golf, city, athletic, faculty, yacht, town and military clubs.